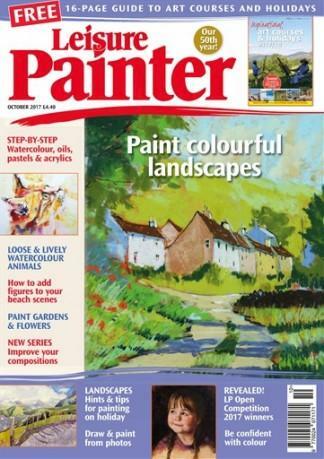 Leisure Painter is the UK's best-selling learn-to-paint magazine and is essential reading for beginners and hobby painters. Leisure Painter is passionate about teaching its readers to draw and paint, publishing easy-to-follow demonstrations by the best-known, most experienced art tutors in the UK, in every issue.Leisure Painter can help anyone to learn to draw and paint, and have fun learning a new, lifelong hobby, whilst making new friends with a similar passion. Simple step-by-step demonstrations, in every issue, make it easy for anyone to create drawings and paintings to be proud of! Readers will also learn about which art materials to buy and how to use them, courses and holidays to go on, books to read, events to attend and how to progress once the basics have been accomplished. All subjects are covered, from simple landscapes, to how to paint your dog, or cat, or a successful portrait of a loved one. Plus enter the many encouraging competitions for beginners, and get involved with a local art club. Whatever, or however you would like to draw or paint, Leisure Painter is here to help! Love this magazine I am just an old beginner and find all the how to do projects great. I enjoy watercolour, pencil, colour pencil and one day would like to try pastel. So these books will always come in handy. Barb.